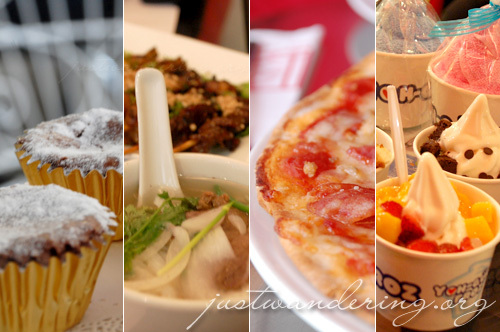 Last Saturday, Ivan ManDy ventured out of Manila to take us for a food tour of Taguig’s Bonifacio Global City. The BGC Food Tour is part of Passionfest 2010 — a series of events that focus on food, fashion, art, music and uh, skateboarding? We were off to a great start; Cupcakes by Sonja in Serendra was our first stop. We sampled delectable morsels of cupcake goodness, which left us looking forward to whatever is next in the afternoon’s itinerary. Next, we sampled Vietnamese favorites at Zao. Our tongue experienced a melange of textures and our taste buds were tantalized by the flavors that burst with each bite. We walked onwards to Bonifacio High Street for the second round. Here, it was T.G.I. Fridays that welcomed us, serving up their best sellers and plying us with bottomless iced tea — perfect for a hot summer day. We continued cooling off at Yoh-gurt Froz inside Hobbes and Lande, happily enjoying the airconditioning and their frozen yogurt. The third and final round was at the Fort Strip, just a short distance away from BHS. We had merienda cena at Pasto, filling our stomach with Crostini, Pasta Genovese and Pizza Di Carne. The eating’s not over though — we still had to go to The Establishment. We were in awe of the cozy interior and overwhelmed by the six-course meal they had in store for us. The best thing about this tour is that it’s FREE! There’s a second serving of the tour on Saturday, May 1, with a slightly different itinerary. Knowing Ivan, it’s bound to be another great hit! The tour is open for all Serendra, Boni High Street and Fort Strip visitors. Just be sure to register at the Concierge at B8 (in BHS) before 1pm on May 1.
wow.. I wonder now if you really eat all of it in one trip?lol. I am jelous because youve been to a lot of places.. I am very much delight with your blog. keep posting more. Very very nice photos. Ginutom ako eh.